Happy to report that over 1000 teachers have now signed our pledge to go paperless for Earth Day! Click here to see the complete list of participants. And click here to make the pledge. I've also started a wiki where teachers can document the things they do with their students on Earth Day. Feel free to leave documentation of all sorts -- written, audio, video. 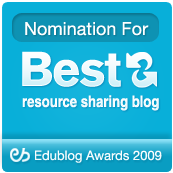 I'd love this to become an evolving resource for teachers looking to go paperless. In comparison, nothing comes close to truly assessing... well... much of anything concerning the intellect, aptitude, understanding, or creativity of just about any human being. "Here's a stick..." he said, "Make me believe in something." What's loud, crude, bloody, and educational? 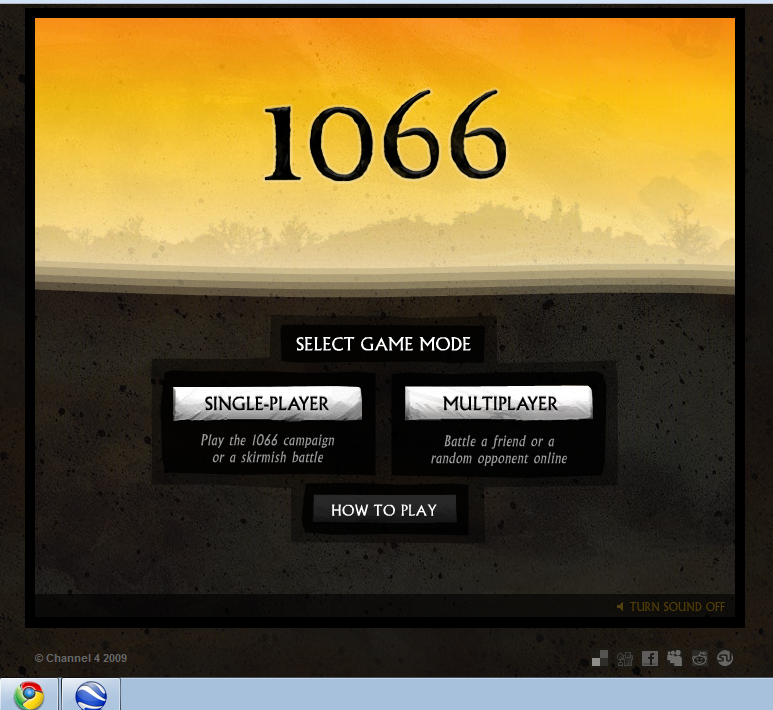 Why, I do believe it's the 1066 game from Channel4. 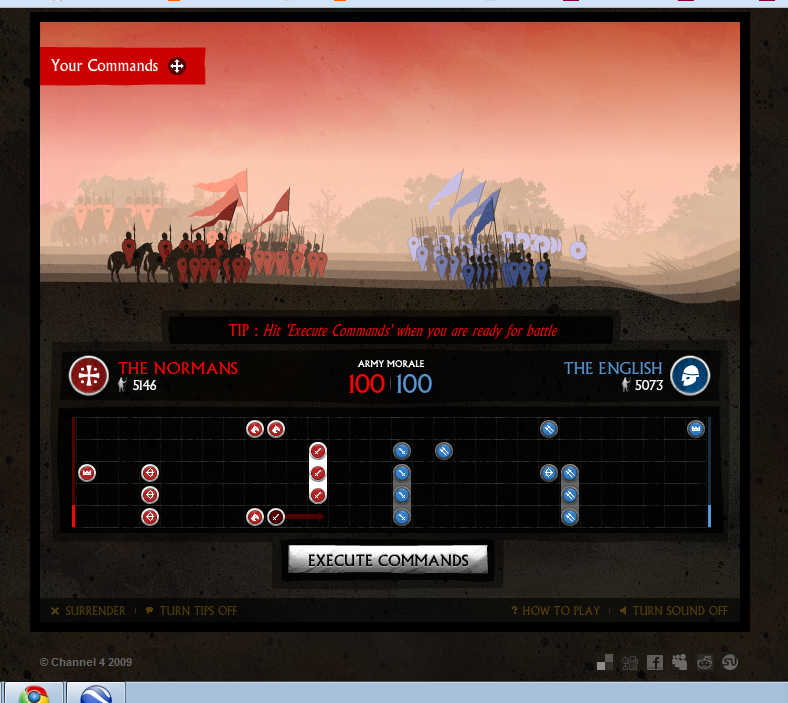 Summing up the three major battles over England in the year 1066, the game lets the player experience warfare from the point-of-view of Viking, Anglo-Saxon, and Norman warriors. 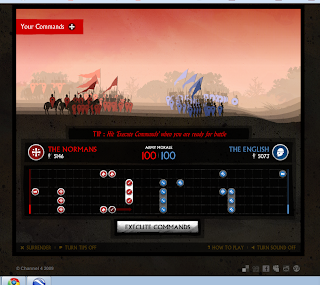 I particularly like the Flash sequences between battles which tell the story of the Viking and Norman invasions in an accessible format easy for students to pick up on. The battle sequences liberally splatter the blood around, so I'd tend to save this one for the older kids. But for the 'older kids' among us, it sure is fun. 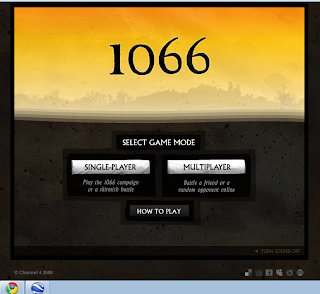 And to extend the logic of medieval warfare beyond the historical battles, the game also allows players to create their own scenarios and play against one another online. One thing's for certain: it surely did grab the attention of my Freshmen like no textbook description of the battles ever has. Thanks to Emily, one of my former students (and now a Classics geek in college), for the showing me the game to begin with. A good couple days. We're at the end of the quarter and it's springtime! So, I'm taking a break from JingCrits for a Paperless Earth Day update. As of 3PM EST, there were 906 teachers worldwide who had taken the pledge to go paperless on Earth Day 2010! The whole list is available online to view; everything is listed alphabetically by school -- so see how many folks from your school are taking part! You can make your own pledge to teach paperless on Earth Day by clicking here and filling out the short form. 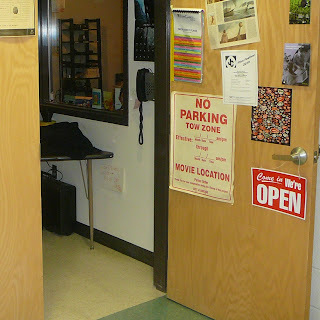 In addition, TeachPaperless has just started working with the Earth Day 2010 Action Center and, in an upcoming post, I'll have more information about what's going on there. Until then, join the Earth Day community of over 750,000 members and add TeachPaperless to your network! Have been using Jing for about three weeks now as my primary form of commenting on student work. Here's a recent example that uses Jing's 'pause' ability to quickly jump between the student's work and online sources and resources. Thinking about the future, I want to experiment with using graphics within Jing; and I would love to hear the experience you all have had jinging the net. Over 800 Teachers Pledge to Go Paperless for Earth Day! Over 800 teachers from around the world have now signed our pledge to go paperless in their classrooms for Earth Day 2010. Can you commit to going paperless for a day? Click here to add your name and pledge! And click here to see everybody who's pledged so far! 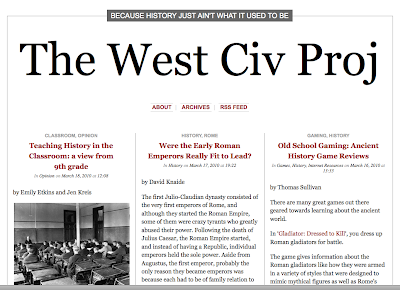 Since the start of this semester, students in my 9th grade West Civ class have been publishing their own blogzine. 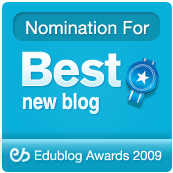 The blog is open to the public and the authors and editors take great pride in their work. They've made mistakes along the way and have humbly corrected them, and they've come up against criticism along the way and have admirable engaged with it in debate. Today, we published a piece by two students. It's a look at how students learn best today and what kind of teaching proved most effective in the past. Mind you, this isn't written by a teacher or an ed school grad. It's just two 15 year-olds thinking about what works for them and taking a look at how folks who were in school in the 60s and 70s had it both differently and similarly. The students talk with a man who in an all-white school in the 1960's encounters his favorite teacher in an African-American woman. They talk to a woman who describes her experience in school and who feels like she missed out on a lot on account of the way the teachers taught. The kids themselves talk about the things that have engaged them; and they candidly describe the sort of teaching that has bored them to death. It's not a completely polished piece. These kids are busy 9th graders, after all. But it's an honest piece. And it's the kind of piece that we as teachers should be reading closely. There's a lot there between the lines. Read it for yourself, and please comment. The students would like to listen to what you have to say too. Today, my 9th grade history class took a digital detour to Scandinavia. 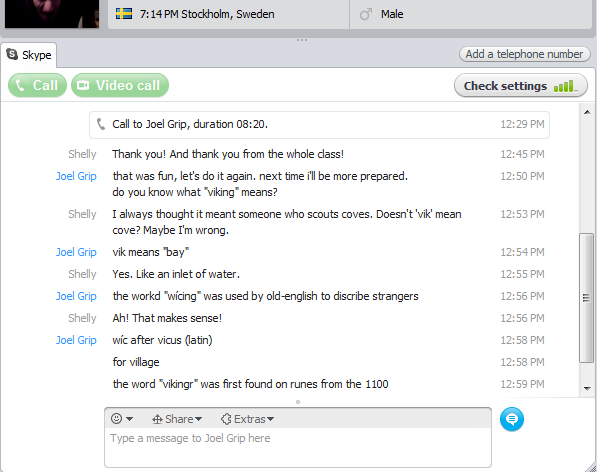 A good friend of mine from Stockholm skyped into our class session on Vikings. American history curricula teach Scandinavian history as if its only contribution to the world was plunder and horned helmets (which of course, as some of my students pointed out yesterday on their West Civ Proj blog, they didn't even wear). So, I wanted to give them a view of what Scandinavian history is really like by having a conversation with someone who actually was born and lives there. My friend Joel is a world-class musician and he's spent the last few years working on NGO projects using music as a way of empowering kids in the forgotten cities of the world. A native of Sweden, he was a perfect choice for a brief conversation with my kids here in Maryland. First he pointed out the different ways Scandinavians think about their ancestors. On the one hand, they were admittedly brutal and severe. One the other, however, they were industrious people who wanted to better their lives and who survived much hardship in the face of climates and limited resources few of us could imagine. Someone asked what Sweden was like today, and Joel described their schools and government as well as the general attitudes of Swedes towards world affairs. And you could see in the faces of some kids a difficulty lining up the modern society he was describing with the limited knowledge they had always carried around about the land of the Vikings. Each week, I give the students a question to ponder. This week's question is: "Who is Good? Who is Bad?" We collect these questions, along with many others, on our class wiki; and we crowdsource for more via Twitter. These questions -- not the facts from some filtered-down textbook -- form the basis of our class dialog. The kids are learning history via the questions we ask about it. And so, after an eight-minute conversation with a stranger a quarter of a world away -- a conversation that threw some theoretical complications into the mix regarding Vikings (Good, Bad, and Otherwise) -- I look forward to seeing how my kids answer the question this week. And just as an aside, I'm gonna say that I'm just so happy that I'm living in a time where I can bring the world to my kids and bring my kids to the world. Over 700 teachers have signed the pledge to go paperless for Earth Day! Thank you to so many of the subscribers to this blog as well as all the great educators on Twitter for helping out and spreading the word. Let's keep this ball rolling! Earth Day is April 22. A reminder to regular readers and an invite to new readers: further the paperless discussion with TeachPaperless on Facebook. 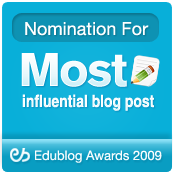 A nice place to find other people involved in 21st century education. After a long day of PD yesterday, I've been thinking about how we see ourselves as educators. Been thinking about what our own education means and how we continue to develop as teachers. Been thinking about real teacher education. Our PD session ended in a faculty discussion where we debated what the role of lecturing is in the high school classroom. On one side, we had folks who said that kids need to "learn to become engaged in a lecture" because that's the primary form of classroom communication they'd see in college. On the other side were the folks who argued that outside of the college classroom, there wasn't a job on Earth where the primary form of communication is lecturing and therefore we should dispel with it in our classrooms in favor of 'real world' education. This of course, is a classic argument that's been going on since at least Mr. Dewey's days. And I think it misses the boat. Because the argument is structured in such a way to propagate the false dichotomy between 'levels' of learning and experience. I'd argue that rather than gear your instructional strategy towards expectations in educational leveling -- i.e. teaching with different strategies to second graders than to college freshmen based on the 'ideas' of what the expectations of teaching and motivation are -- what we really should be doing is understanding who our students are in a meaningful and compassionate way and, without any preconceptions about what's going to 'work', we should be formulating approaches democratically with the input -- and veto power -- of our students. The students deserve the veto. It's their education, after all. And if the teaching method you are using isn't working for them -- be it lecture or open learning or project-based or what-have-you -- then they have a right and obligation to petition you to understand what would work for them and you have a professional obligation to try out new strategies. Professional and necessary? Even more so. I'm tired of teachers acting like their 'tried-and-true' method is the only way. I was tired of it as a student and I'm tired of it as a teacher. It's arrogant and it stinks of the fear of losing the comfort of the 'normal'. Nothing about your students is 'normal'. I realize that I can be a bit militant in the pages of this blog. And I fully realize that I've got an ego and personal arrogance that occasionally makes me look like a jackass. So I'm gonna say right here right now: Don't base your teaching approaches on the arguments that you hear on this blog. Rather, base your teaching approaches on the conversations you have with your students. Find out who they are. Ask them how they learn. Challenge yourself to figure out how to teach them. Each of them. Because in the end, this isn't about lecturing vs. not lecturing. It's not about preparing kids to be able to handle college. It's not about the authority of one form of instruction over another. It's about engaging minds and empowering individuals. That's it. That's the whole point of education. And you ain't gonna engage the mind of a student by arguing the finer points of pedagogy with your colleagues. You're only going to engage the minds of your students by learning from them how their minds work. You've got to talk to them. You've got to know them. And you have to trust one another. Real teacher education happens when you leave your ego behind and jump into the learning process as not a 'teacher' or a 'facilitator' but as a fellow human being who has compassion for human beings and who recognizes the real importance of education as the armor of empowerment. Because the 'real world' is an endlessly relative term; and what we really want is not to produce students capable of dealing with one kind of 'real world', but capable of adapting, showing compassion, and helping to empower others in whatever world in which they may find themselves. Steve Katz posted a nice summary of where this Paperless Earth Day idea came from on his blog. Check it out; tell Steve "THANKS!" for instigating this whole thing; and then be sure to join over 650 teachers from around the world in pledging to go paperless for the 40th Earth Day this April 22, 2010. Remembrance of Things Past: What is the new iPad ad suggesting about Apple's intended audience for the new device? What is the new iPad ad suggesting about Apple's intended audience for the new device? First of all, despite the edgy-guitar pop hooks that give the soundtrack to this ad that iPod flavor, the visuals are completely... well... milquetoast. We're in a house decorated by Pottery Barn with a couple of indeterminable age who favor bluejeans and skiing. The couple are 'readers'... you know, they read 'books' and 'newspapers'; no Boing Boing or Daily Dish in this house, kids. Chatroulette is right out. Second, they love the travel. They read the 'Escape' section of the Times and have friends who send them pics of trips to Switzerland. We might assume that these folks have made it through the Great Recession alright and are looking for an opportunity to drop some buckage on a hotel with a hot tub and a view. Next shot: look! They write emails that look exactly like 'real' letters! And then, just when I thought I had the market for this device pegged as upper middle class Boomers: they go and throw in that snowboarding article. How edgy! Why, we must actually be looking into the secret life of a Gen Xer with typical 1960's fetishes -- Kennedy, The Doors -- and definitely not folks who'd prefer receiving a letter on 'paper'. One of the things that's most striking about this ad is the way it blurs together stereotypical Boomer and Gen X interests and tendencies into a composite whole. Notably absent from the video are any of the ways people will actually most often use this device (3rd party apps, 3rd party apps, 3rd party apps) [and I should add 'making stuff', though as of now, there appears to be no simple way ala the typical Macbook avenues to 'make stuff']; instead we're presented with Apple-lite for folks interested in the technology thing, but who have real lives planning ski trips and giving harbor to nostalgia dressed up as hipness. I'm struck by the images of media that I caught the first time I watched the ad: Star Trek, Steven King, Jim Morrison. There is nothing remotely 21st century about this. The device might be as "magical" as all get-out; but the ad campaign -- and we can assume the intended market's world view -- is entirely based in nostalgia -- and I'd argue -- a certain big-company-fed cynicism towards new media and what's actually happening NOW on the Web. Click here and enter into a wonderful classroom project. @vtdeacon is putting this together as a "Crowdsourcing Questions" project. Personally, I'm so excited about this sort of thing. We've had such a good time the last few weeks in my 9th grade West Civ class running our syllabus as a crowdsourced document -- and we'd love you to stop on by after you leave a question or two on @vt's wiki. Collaboration. It's a beautiful thing. Over the past week and a half, I've had several great conversations with former students... especially recent grads. By-and-large these students and I have kept up our friendships via social media. @schickbob and I were talking about this today and came to the conclusion that -- in a way -- the future of education is bound up in the ways that we relate to our alumni via the social connections of the Net. Because the future of education isn't about the classroom; it's about the world. And your alumni are the bridge between the two. With that in mind... if any old alums happen to be reading this, do get in touch. We need you now more than ever. Click here to see the current list (organized alphabetically by school name). Especially for new readers, here's a list of the eleven most read articles on TeachPaperless (as of, well, today). Sort of a miniature 'TeachPaperless Reader'. There are times when we need to feel that pencil sketch across the pad. 4. What are we preparing them for? I'm obliged to recognize that I'm of a generation caught in the transition between two ages. 5. Go Paperless for Earth Day! Source reduction is the best form of conservation. I blog and what I blog -- and how that message is received by others -- tells me what I think. And it tells me how I think. To blog is to teach yourself what you think. 8. Thoughts on History and the "Important Questions"
9. Tech Engaged by Default? we are presented with the opportunity both to re-train and re-employ citizens and spread access throughout the country by means of a public works program for Internet connectivity and community training in digital literacy. Been experimenting for the last couple days with Jing. 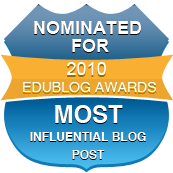 And among several uses I've found for it, by far the most important for me has been as a means of giving in-depth feedback to students on their blogs and in their writings. I'm not the only teacher who has been frustrated by the limitation -- especially on blogs -- for marking up and commenting on student work. And so I've been looking for an alternative. 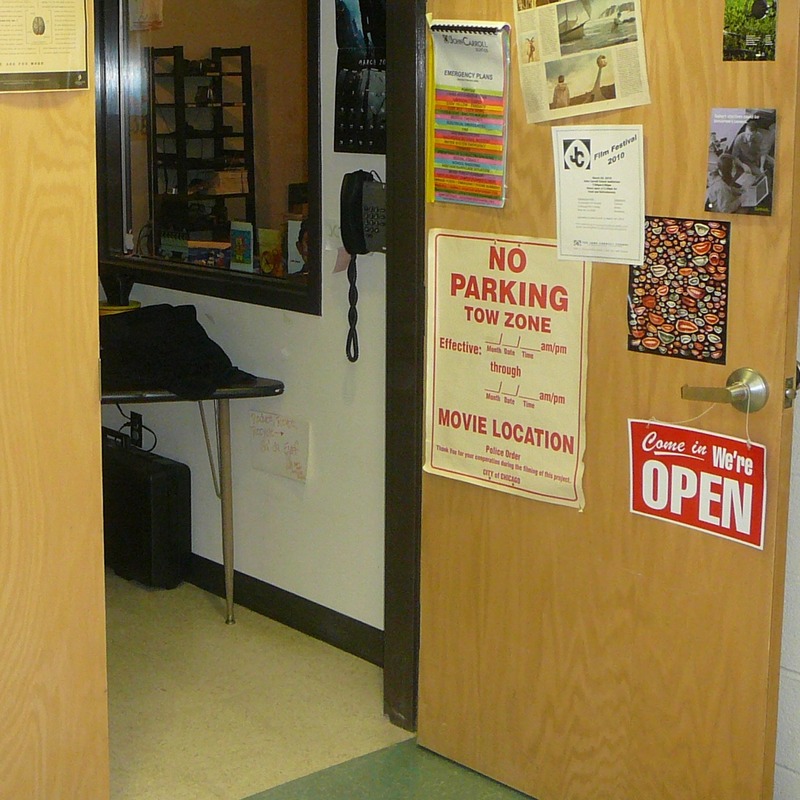 I wanted something that was more flexible, more personable, and more similar to a one-to-one conference with a student. Jing supplies all of that. Here are two examples of my use of Jing to assist in the assessment of student writing. The students are 9th graders in History class. You'll see that I'm pushing them to think about the sources they use and to think about how they structure an argument. I know many of you have used Jing for all sorts of purposes and would love it if you would share your most interesting ideas. In a way, I'm embarrassed that it took me so long to realize that the solution to my problem was sitting there right in front of me for so long. But, such is learning. 500 Teachers Pledge to Go Paperless for Earth Day 2010! To celebrate the 40th anniversary of Earth Day, over 500 teachers worldwide have pledged to go paperless in their classrooms for the day. Here's a link to the original call. Here's the place to pledge. Here's a spreadsheet of teachers who have pledged. Thanks for all your words and actions. So, I've put together a brief presentation about the digital flashcards I'm using with my West Civ students. I know that when most people hear the word 'flashcard' they think 'rote memorization'. I think though, that the concept of the flashcard can be turned on its head in the Digital Age. Check out the presentation and tell me what you think. Woke up to a pleasant surprise. Turns out that the Green Team at South Middle School has challenged their entire student body to go paperless for Earth Day! Would love to hear about other schools taking on the pledge school-wide. As of right now, over 430 teachers from around the world have taken the pledge to go paperless on April 22, 2010, the 40th anniversary of Earth Day. You can pledge by clicking here!